Anbau Enterprises has received $138.6 million in construction financing for its two-building condominium project in the Flatiron District, according to sources familiar with the deal. 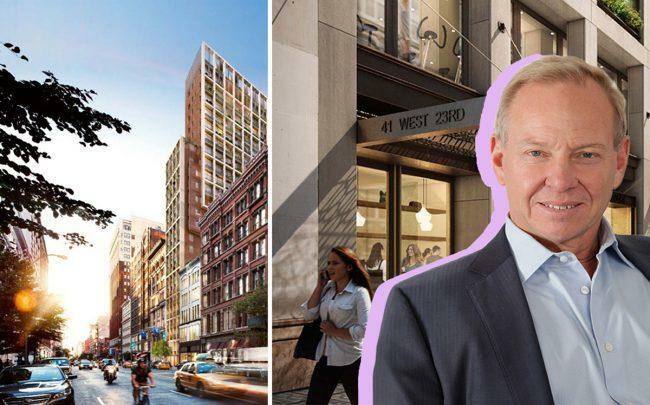 Bank OZK, one of the most active construction lenders in the country, provided the developer with a $96 million senior loan, while Goldman Sachs originated $42.6 million in mezzanine debt. Bank OZK was not immediately available for comment, and a representative for Goldman declined to comment. A Meridian Capital Group team of Adam Hakim, James Murad and Andrew Iadeluca arranged the deal. The project from Anbau will include a 24-story tower at 39 West 23rd Street and a 10-story building on West 24th Street. It will include one retail unit and 48 residential units across 117,000 square feet. Anbau paid $23.5 million for the site in 2011, which housed a parking lot at the time. The developer is currently pouring the concrete on the fourth floor of the COOKFOX-designed project. Sales should start in spring 2020 and the development should be complete by early 2021, according to Anbau. Anbau also recently bought two adjacent parking garages in Hamilton Heights for $22.5 million, where it plans to build a pair of condo buildings with 150 total units.